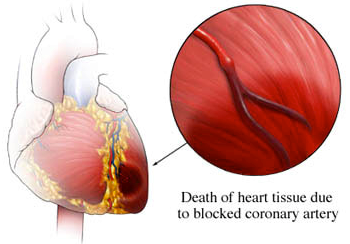 In acute myocardial infarction, one of the coronary arteries (heart blood vessels) is occluded by thrombus resulting in a part of the heart not supplied with blood (ischemia) and threatened with permanent necrosis. Depending on the extent and location of myocardial necrosis, myocardial infarction is classified into transmural (with Q-wave and ST segment elevation on the electrocardiogram, STEMI) or subendocardial (without Q-wave or ST segment elevation on the electrocardiogram, NSTEMI). Acute myocardial infarction is typically due to coronary artery disease (atherosclerosis of the blood vessels of the heart). Risk factors for coronary heart disease is high cholesterol, diabetes, hypertension, smoking, hereditary predisposition, obesity, etc. Acute myocardial infarction is usually manifested as chest pain (angina) that lasts over 30 minutes and may be accompanied by shortness of breath, profuse sweating (diaphoresis), dizziness, weakness, feeling of faintness, nausea or vomiting. In some cases acute myocardial infarction is manifested as sudden death. In 25% of infarctions there are no symptoms (silent infarction). The diagnosis of myocardial infarction is made by clinical examination and is documented by electrocardiogram and biochemical blood tests (troponin test). Other tests that help in diagnosis is echocardiography and coronary angiography (angiography of coronary vessels). The goal of treatment is fast restoration of blood flow to the myocardium. The usual treatment is the administration of a drug that dissolves the thrombus (thrombolysis). However, it is now widely accepted that the most appropriate treatment for acute myocardial infarction is acute or primary coronary angioplasty with thrombus aspiration. It is clearly better than thrombolysis because it reduces the relapse rate and is accompanied by fewer complications. To have a better result, emergency angioplasty should be done within 2 hours of symptoms onset and, of course, it requires a catheterization laboratory with interventional cardiologists on duty 24 hours a day. Progress of technology has contributed to the improvement of materials used for invasive treatment of acute myocardial infarction and coronary artery disease in general.